Immigration activists demonstrate at the Supreme Court in Washington in support of President Barack Obama’s executive order to grant relief from deportation in order to keep immigrant families together, March 18, 2016. The U.S. Capitol is in the background. On April 18, the U.S. Supreme Court is set to hear oral arguments in a lawsuit, United States v. Texas, brought by more than two dozen states challenging an immigration enforcement policy by the secretary of homeland security. If successful, the lawsuit could tear apart millions of American families, while at the same time greatly undercutting the U.S. economy. 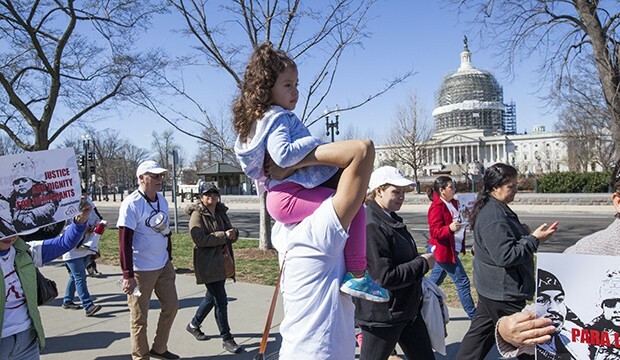 Twenty-six states filed a lawsuit challenging the Deferred Action for Parents of Americans and Lawful Permanent Residents, or DAPA, initiative along with the expansion of the existing Deferred Action for Childhood Arrivals, or DACA, initiative. Under DAPA, DACA, and expanded DACA, certain unauthorized immigrants who have lived in the United States for many years and who either came to the country as children or are the parents of U.S. citizens or lawful permanent residents can come forward, register with the government, pass background checks, and request deferred action—a temporary protection from the threat of deportation. With deferred action, such people are also eligible to request permission to work in the country legally. The implementation of both DAPA and expanded DACA has been temporarily placed on hold while the case works its way through the courts. Here are four key facts you should know about the states that are suing to freeze DAPA and expanded DACA. Nationally, the three deferred action initiatives—DAPA, DACA, and expanded DACA—are estimated to grow the U.S. economy cumulatively by $230 billion over 10 years. The reasons for this are fairly simple. As professional economists and scholars in related fields recently explained in an amicus brief to the U.S. Supreme Court, when unauthorized immigrants gain work authorization and protection from deportation—even temporarily—they are able to find jobs that make full use of their skills and abilities, earn higher wages, and become even more economically productive. What’s more, individual states can expect to see their economies grow as a result of these initiatives. Together, 18 of the 26 states suing to freeze DAPA and expanded DACA stand to lose an estimated $91.9 billion in increased state GDP over 10 years if the three deferred action initiatives are not fully implemented. And while the original DACA initiative is not under review in United States v. Texas, the 5th Circuit Court of Appeals’ decision places a cloud over it as well. Because of the enormous economic activity that would be generated by these initiatives, the cumulative earnings of American workers would increase by an estimated $124 billion nationally. 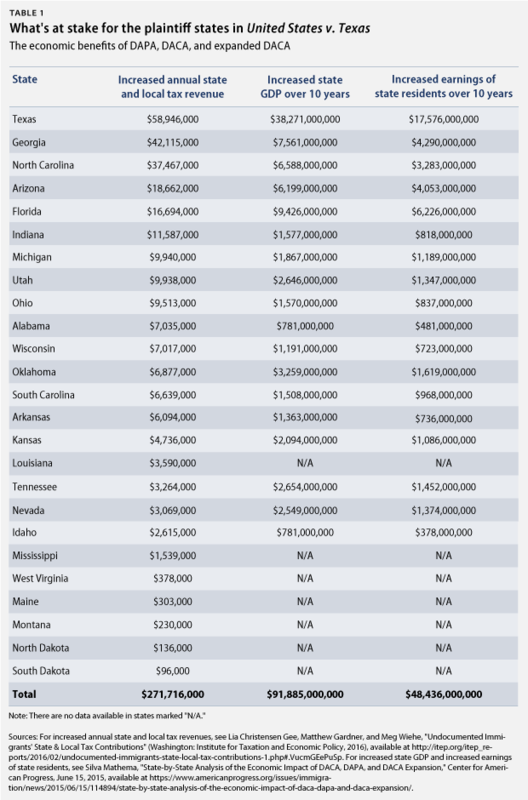 In the 18 plaintiff states for which CAP has data, we estimate that implementing DAPA, DACA, and expanded DACA would raise the earnings of these states’ residents by more than $48.4 billion over 10 years. Unauthorized immigrants contribute enormous sums to state and local coffers through taxes:$11.64 billion annually, according to a new report by the Institute on Taxation and Economic Policy. Full implementation of the three deferred action initiatives would increase state and local tax contributions by unauthorized immigrants by an estimated $805 million each year. And it’s not just states and localities that would stand to lose additional tax revenues: The nonpartisan Congressional Budget Office and Joint Committee on Taxation studied the budgetary effects of legislation to block DAPA, DACA, and expanded DACA and found that the bill would reduce federal tax revenues by $22.3 billion over a 10-year period, leading to a $7.5 billion increase in the deficit over that same period. By definition, the parents of American citizens or lawful permanent residents who would be eligible to apply for DAPA have deep roots in the United States. Nearly 70 percent of anticipated DAPA beneficiaries have lived in the United States for at least 10 years, and a full one-quarter have lived here for at least 20 years. According to an estimate prepared for CAP by the University of Southern California’s Center for the Study of Immigrant Integration, there are more than 6.1 million U.S. citizens around the country who live in the same household as a DAPA-eligible family member. California leads the pack with an estimated 1.8 million individuals, but Texas comes in a close second at nearly 1.1 million. 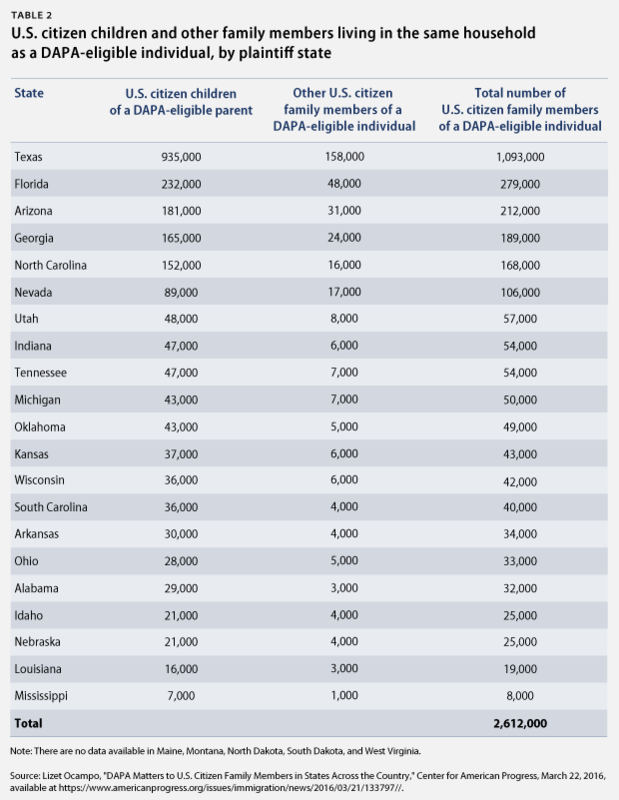 And in the 21 plaintiff states for which CAP has data, there are more than 2.6 million U.S. citizens living with a DAPA-eligible family member. Given the facts presented above, it is little wonder that the largest cities and counties in many of the plaintiff states filed an amicus brief with the Supreme Court arguing in support of DAPA and expanded DACA. If the Supreme Court overturns the lower court’s decision and permits these policies to take effect—as it should—not only will the nation as a whole benefit from the implementation of these sensible policies, but the plaintiff states will benefit as well. Tom Jawetz is the Vice President of Immigration Policy at the Center for American Progress. Reblogged this on Rural Nevada Democratic Caucus.